737 FMC CDU - Ordering the PCB | Life, The Universe and ... Everything! A few people have asked me how to order the PCB for the FMC CDU, so I've decided to write up a guide. To begin with, the design is available for free. I used EasyEDA.com to make the schematic and PCB design available. 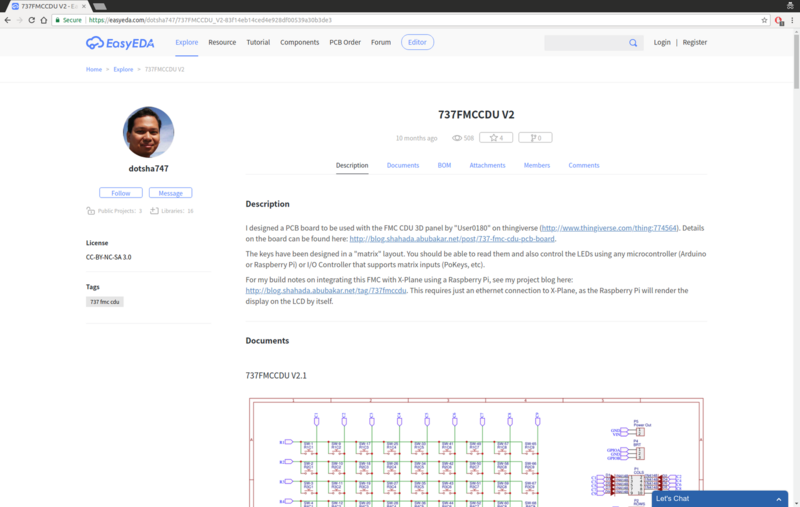 If you are into electronics design, you can make a copy of the schematics and PCB design and make whatever changes you like, provided you comply to the license terms. Please do read through them as there are some restrictions that apply. If you just want to buy a ready-made PCB, I don't sell them directly at this time. 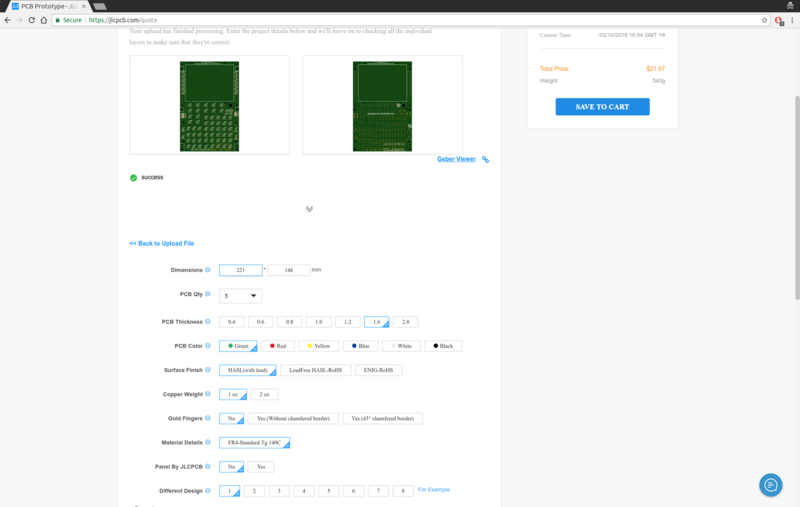 However, you can download and send the design (in GERBER format) to any PCB fabricator, and they will fabricate and ship them to you. The process is quite straightforward. 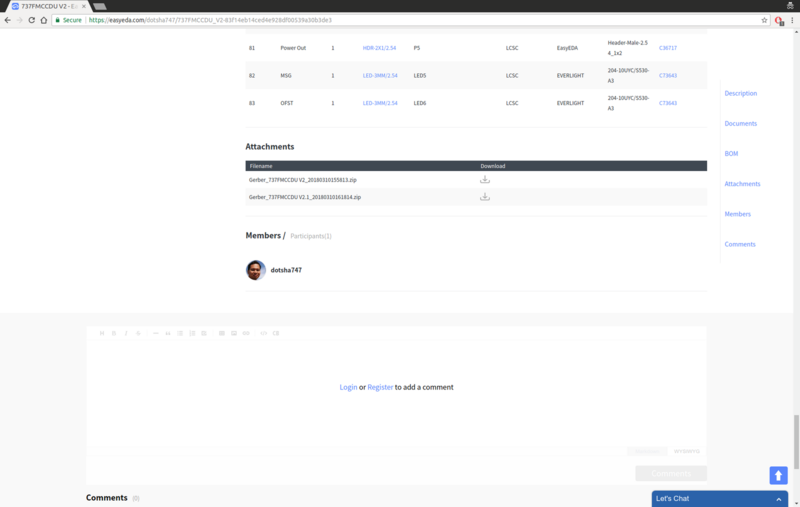 Click the tab labelled "Attachments". The page will scroll down by itself. You can download the GERBER files from the link here. This is the initial version I made available. I use it for my own FMC and it has also been fabricated by a few other users who have got it working. However, there are some minor bugs with the printed labels on the board. The workarounds are detailed in my blog post here (http://blog.shahada.abubakar.net/post/737-fmc-cdu-questions-and-answers). I fixed the orientation of the OFST LED and Diodes 1-8. You can now follow the orientation on the printed PCB. Added an attribution label on the reverse side. If you are making changes, please add your own attribution while preserving the original (see the license terms). I changed the track widths from 8mil to 12mil. 8 mil worked fine with the fabricator I used, but some may not be able to make tracks that narrow. I used EasyEDA's sister company JLCPCB.com to fabricate the PCBs. Alternatively, you can use any fabricator, ideally one that is located close to you to save on shipping charges. 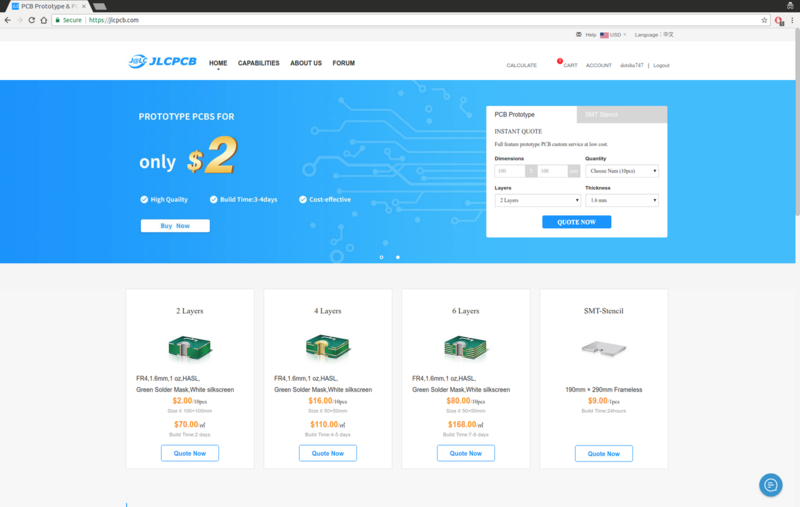 Browse to https://jlcpcb.com/ and register an account. Select "Buy Now" from the home page. Click "Add your Gerber File" and upload the GERBER file you downloaded in Step 2. Change the Quantity to the minimum, 5. Depending on your local regulations, you may require Surface Finish "LeadFree HASL-RoHS". You can leave most other settings as they are, as this is the cheapest configuration. You can see the cost on the panel on the right (USD21.67 for me). 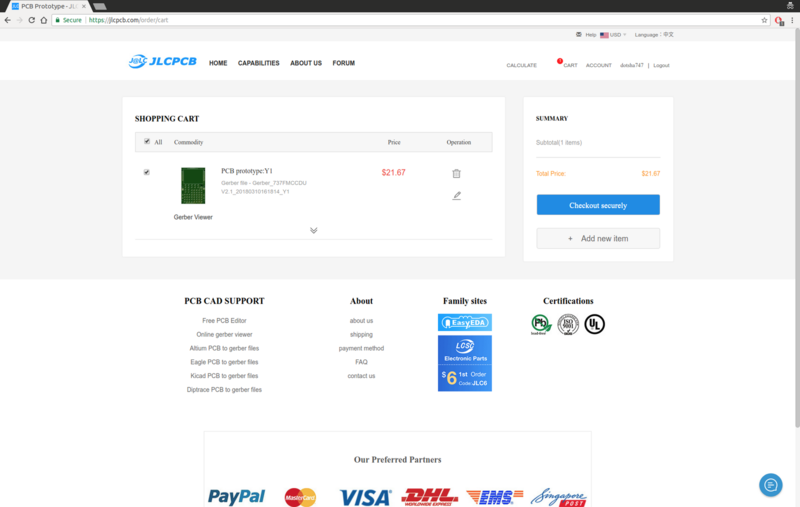 Click check out and provide your shipping address, and select shipping method and payment method, and press Pay to complete your order. Wait for your PCBs to arrive! Almost all PCB fabricators have a minimum order quantity of 5. You will need at most 1 or 2. What do you do with the other 3? The license terms on the design has a No-Commercial-Use restriction. I would suggest doing what one highly charitable person did, which is to give them away for free. I'm also willing to make an exception if you are just selling it to recover your cost (i.e. no more than USD5 per piece + shipping) provided you also inform any potential buyers that (1) the design is freely available (2) provided them the link where you got it from (i.e. this page) and (3) make sure they are aware of the terms and conditions concerning the design. I also need to make clear that legally, I am just providing the design, which is free and therefore come with no warranty. Your contract with whichever fabricator you choose is between you and them. Having said that, if you have issues, feel free to post a comment on this blog (http://blog.shahada.abubakar.net/post/737-fmc-cdu-questions-and-answers) and I will help if I can. If you are building a FMC CDU using this board, I would love to know about it ... do drop a comment or send me an email! If you live in Malaysia and want the PCB, please contact me.